Many people braved the sultry London afternoon and came to the Calder Bookshop Wednesday evening, preferring our company and a glass of wine to the footballing feats of Ronaldo, Iniesta and Fabregas. The even was the launch of my new novel, InterRail, and Jim Keeble’s The Happy Numbers of Julius Miles (recently reviewed in the Guardian) – two very different books in style, tone and setting. Jim’s book is modern, inventive, linguistically explosive and urban. My book is more traditional, gently humorous and cosmopolitan. Jim’s book has a self-styled transexual God of Love as the narrator, my book has a twenty-one-year-old Italian Candide – if such thing ever existed – as the hero of the story. It's been some time since our last post and the reason for this is that we've been busy revamping Oneworld Classics and launching the new imprint Alma Classics! In Spring 2007 Alessandro Gallenzi and Elisabetta Minervini, founders of Alma Books, launched Oneworld Classics in partnership with the directors of Oneworld Publications, Juliet Mabey and Novin Doostdar. During these five years Oneworld Classics took on the legendary Calder Publications list (founded in 1949) and launched a new music imprint Overture Publishing. We are now delighted to announce that Alma Books has acquired Oneworld Classics and will be rebranding this amazing collection as Alma Classics. Apart from revamping these much loved titles and breathing new life into them we will also continue the Oneworld Classics mission, publishing not only the greatest masterpieces of all time but also making available unjustly neglected works of enduring significance. Alma Classics will continue the publishing program set by Oneworld Classics for Spring 2012 but significant changes will happen in the latter half of the year when we plan to launch new editions of bestselling titles with new covers and extra material. Most of the Oneworld Classics titles are still available for purchase however in the next three years Alma Classics will gradually replace them with new volumes. Show us your support and post us a message on facebook and twitter! In spite of the Olympics buzz not many are optimistic about 2012 and the howling weather isn't helping much but we're hoping to start positive and prepare for some major changes this year. No purchase or payment is necessary, simply log in now! Offer ends 29th February 2012. We are also offering a set of our 10 Overture Opera Guides (worth £120!) plus a one-year free subscription to Opera Now magazine. 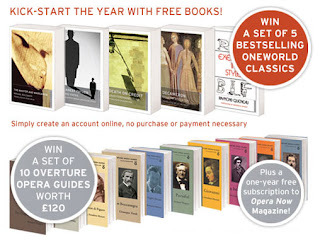 To win simply tell us which opera you would like to see covered by Overture Opera Guides? Email your answer to competition@oneworldclassics.com (competition ends 15th February 2012). For Alma Books we have decided to extend our Christmas Gift promotion and are giving every customer who makes a purchase from our website a free surprise book (valid for UK residents only, offer end 31st January). Both websites currently have a 40% discount for every online order for January only, so this is the last chance to purchase some amazing titles at low prices. We hope this is the start of many competitions and offers to come during the rest of the year.